by Filgueiras, M., Damas, L., Moreira, N.
Filgueiras, M., Damas, L., Moreira, N.
This volume is the proceedings of the Second Advanced School on Artificial Intelligence (EAIA '90) held in Guarda, Portugal, October 8-12, 1990. The focus of the contributions is natural language processing. Two types of subject are covered: - Linguistically motivated theories, presented at an introductory level, such as X-bar theory and head- driven phrase structure grammar, - Recent trends in formalisms which will be familiar to readers with a background in AI, such as Montague semantics and situation semantics. The topics were chosen to provide a balanced overview of the most important ideas in natural language processing today. Some of the results presented were worked out very recently, are the subject of ongoing research, and have not previously appeared in book form. 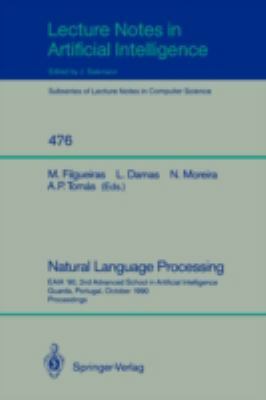 This book may serve as a textbook: in fact its contents were intended as lecture notes.Filgueiras, M. is the author of 'Natural Language Processing', published 2007 under ISBN 9783540536789 and ISBN 3540536787. Loading marketplace prices 104 copies from $12.85 How does the rental process work?